Last week during my lessons in Lecco I experimented with a new time tracking device. and we’ll all talk about it for a while (Q&A). Lately I added a new recipe to the formula: ask them to tell you stuff (mostly around what they’re interested about) and prepare a lesson around those topics, but that’s a different story. Thing is, you need to be careful in balancing these elements in a lesson, otherwise you might end up with issues. 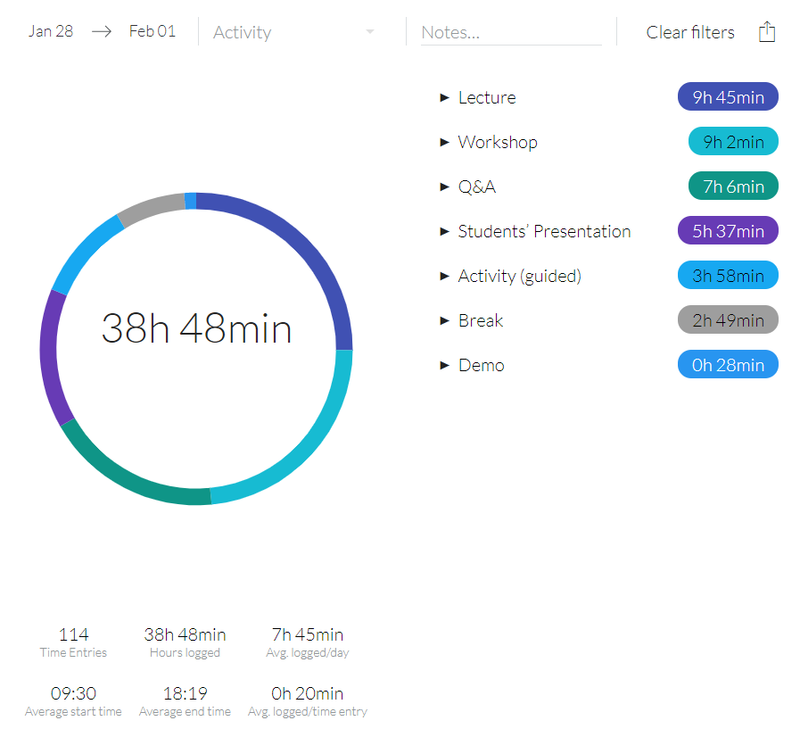 I used to work with a timer for some of these segments, specifically Lectures to track myself and students’ tasks such as Guided Activities, Workshops and Student’s Presentations because those usually are time-framed. With this system however I could only track some of the segments and I couldn’t tell at a glance whether we spent a lot of time on Q&A and how much did my demonstrations took up of the overall time. Just remember that the main point of a lesson is not to show students how cool you are: is to show them something they don’t know and allow them to try it in a controlled environment. 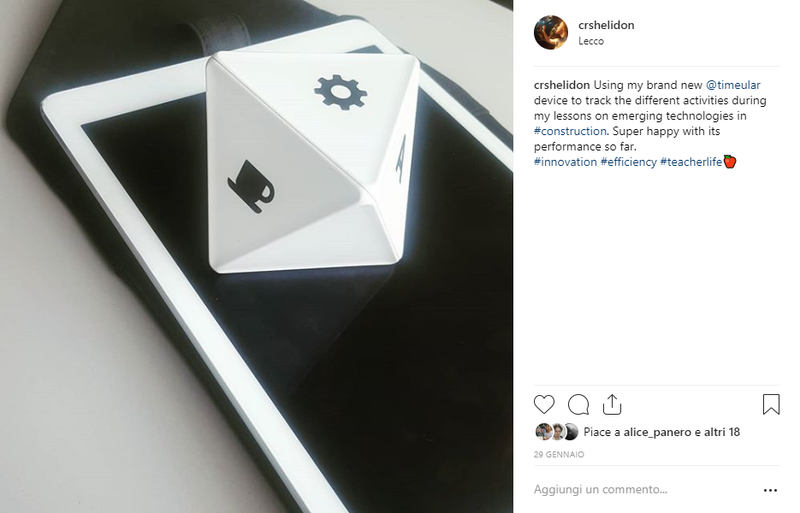 Hence I was very interested when I first saw the advertisement of Timeular on Instagram. They call him ZEI° and it’s a white prism with faces you can customize: it comes with stickers, a pen to write on it and an eraser to delete your doodling, but since I’m obsessed with ruining stuff I didn’t try the pen yet (and I was very nervous with the stickers too, I’m telling you). It has a bluetooth transmitted and it can be paired with any device, from computer to smartphone to tablet. You see it in the picture below, placed on my iPad for scale. On each face you place the symbol of the activity you want to track, you record the correspondent activity on the app (it’s in cloud, so you only need to do it once and it will remember you from any device you might pair later on) and then, when you turn it on, it will start tracking time for the activity associated to the face you see on top. When you shift from an activity to the other, you simply turn the prism. It will leave you a couple of seconds and it will start recording the new activity. The app provides you with a calendar, on which you can see the entries in sequence and, if necessary, make adjustments or drop notes. If you’re working by yourself you might also give a look at that “Productivity Level” index, calculated through a proprietary algorithm that’s explained here. Of course that’s not relevant for a classroom, but should the guys at Timeular be interested in a spin-off, they know where to find me. When you’re done adjusting your entries, you can have a report like this one below and this is telling me a lot. We clearly have an issue with starting at 9:00, for instance, but the overall tracking is ok. I’m proud of the fact that we have an even distribution between me blabbering and the students working and I’m not surprised to see that there were so few demonstrations on my behalf: it’s almost the end of a 5 month master, so we’re in the weaning phase. Alongside that, we’re having way too many breaks: I’ll have to turn the screw a bit on that. Another important information for me is that we rarely have activities that last longer than 20 minutes and that’s good: we know that learning works best with shorter cycles. Overall it’s not perfect but I’m happy. Most importantly than me being happy with our performance, now I know. Which is the first step towards improvement. The tracker also provides you with a good timer, so I have no use for that anymore. You can also track directly from the app, if you don’t have the prism with you or it doesn’t connect for some reason, but right now I have to say that the little thing is behaving quite nicely. If you have the premium version, which I don’t have yet, you can also export data and use it for invoices or other kinds of analytics. With the APIs you can also do pretty much anything you want. I’m really satisfied and I don’t see myself going in class without it for a very long time.